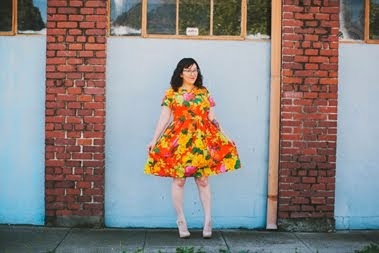 I have been dying to visit Sew LA for one of their fabulous parties and now I have the perfect reason, Gertie is coming to Los Angeles on Sunday! Qui, Jessi (Qui's twin/my good friend), and I will be headed down south on Saturday for some shopping at Mood and the garment district. I'm not sure what we will be doing Sunday before the party, suggestions? Even though I go to LA every so often, I'm not sure of where I should go. I'm completely jealous of your Sunday plans! I hope you'll find time to take some photos and share your trip with us. I will hopefully be there! If you are downtown for lunch the Nickel Diner on Main st. is fun. They have a bacon maple doughnut. Cool, we will have to talk while we are there :) And I'll run Nickel Diner by the girls. I'd love to go, but I don't think I can make it up to LA this weekend. I have no doubt you are going to have a great time! Let me know if you can make it, I would LOVE to see you! Hey - Mood has moved to La Brea (closer to Sew LA) - so check the address before you leave - I just went to their store last week and it is much bigger. 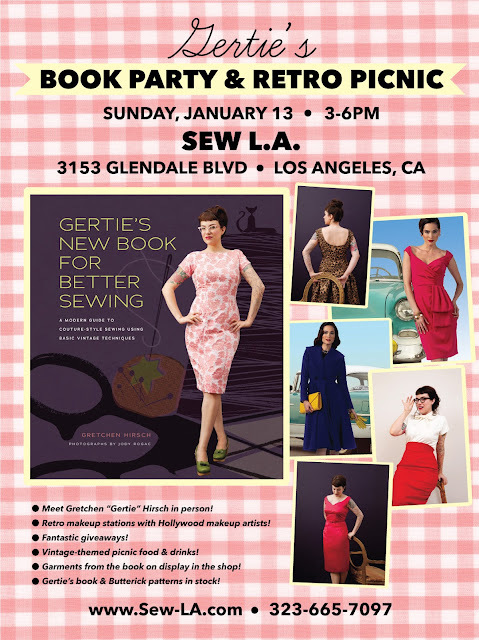 I too am considering going to the Sew LA Gertie party. I learned to make patterns there! I will be there! I am so excited because I missed the last few they hosted and was really bummed. Can't wait to see you there! I have never been to one of their parties. Well, I've never been to Sew LA either, so I am super excited for Sunday! See you there! Have so much fun! Gertie is so nice-- you'll love meeting her! I'm nervous to meet her! I'll probably get all tongue tied and say weird things haha. You may want to check out Bottega Louie for lunch downtown. It is a fun hotspot that is really yummy and their macaron's and desserts are so beautiful it is worth it just to go and drool at the counter. Don't be overwhelmed it if is super busy. They are good at getting people in and out. I am also planning on going to the party so perhaps I will see you there. Hi Erin! It was nice meeting you today...Just messaging you so you can find me once you get home! Hope you had a good time! Arg! I missed it! I hope it was fun! I happened to stumble on your blog and decided to be a follower, would you please due the same for me?